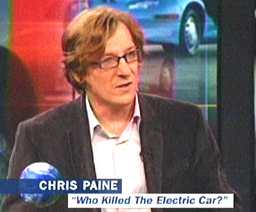 I knew Chris Paine way back in 1993, when I was working with him on Telemorphix's 21st Century Vaudeville. He was a really sweet, smart, and very creative guy with big ideas about everything. Nice to see him pull it all together to create his little masterpiece, Who Killed the Electric Car?.